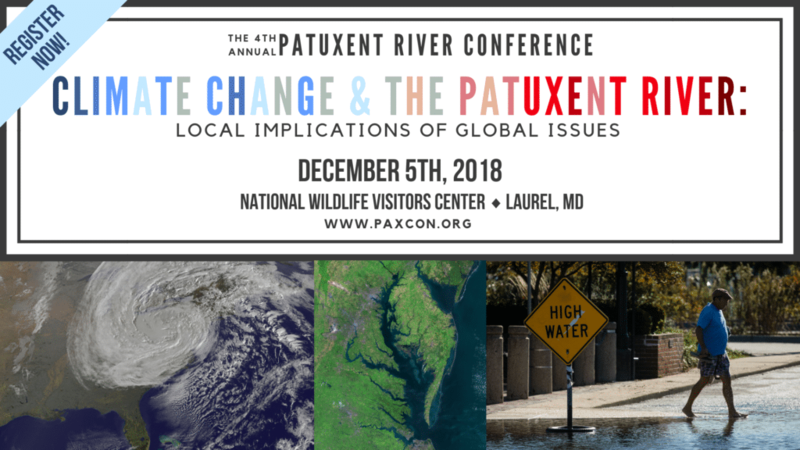 2018 Patuxent River Conference – Register Now! Registration is now open for PAXCON 2018 which will take place Wednesday, December 5, 2018 at the National Wildlife Visitor Center in Laurel, MD. The theme of this year’s conference is Climate Change & the Patuxent River: Local Implications of Global Issues. This theme was chosen based on feedback from last year’s conference participants who wanted to learn more about climate research occurring in the region as well as learn best practices for climate change focused communication, outreach and advocacy. Participants will leave the conference not just with new knowledge about climate changes impacts on the Patuxent River Watershed but also a network of colleagues that are inspired to take action to improve the river. Register today! Early bird registration of $30 ends November 5th. The Patuxent River Conference is not possible without the generous support of sponsors. If your organization would like to serve as a sponsor of the conference please contact our conference team at patuxent.river.conference@gmail.com.